Hello! How is your week going? I feel like the weather is messing up up this week but I'll just have to live vicariously through summer nails! So that being said as you can probably already tell today its all about pineapples. I mean they are pretty summery and they are so fun to wear. Going to change things up today and share the video first! 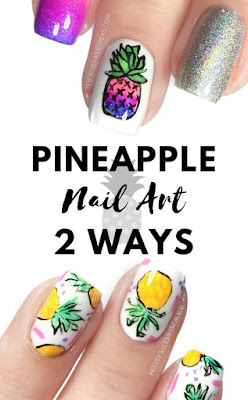 Todays video shows two brand new Pineapple designs and I enjoyed wearing both of them so much. They are pretty simple ones, and the first design only requires one polish the rest is acrylic paint. 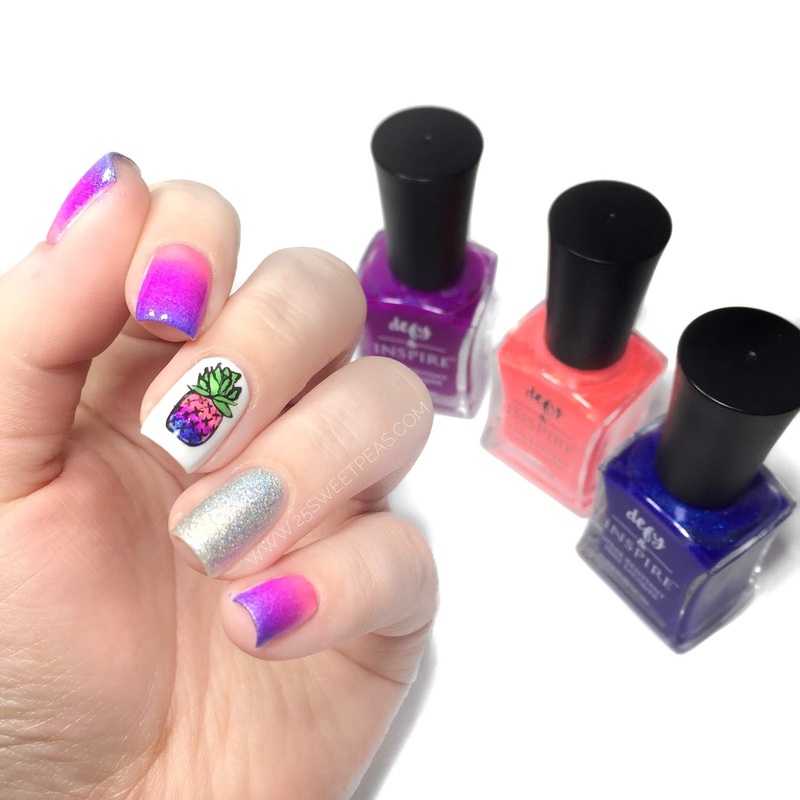 So lets take a look at each mani and I'll go over all of the details! 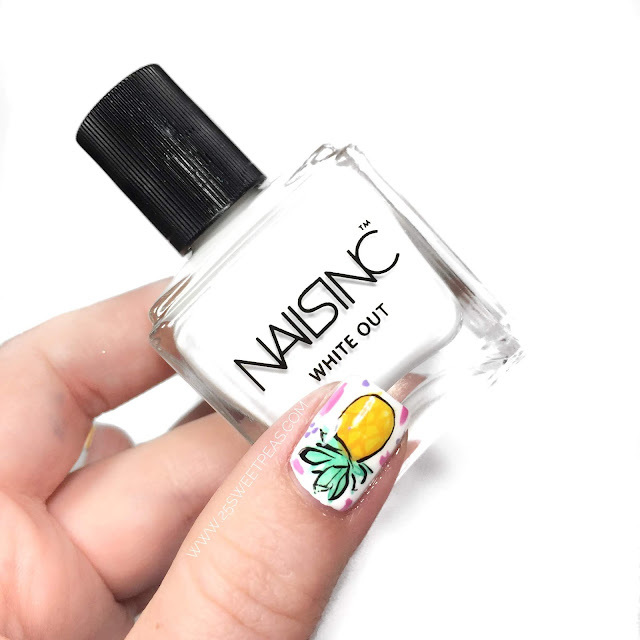 The first mani is this one! It starts with a white polish. 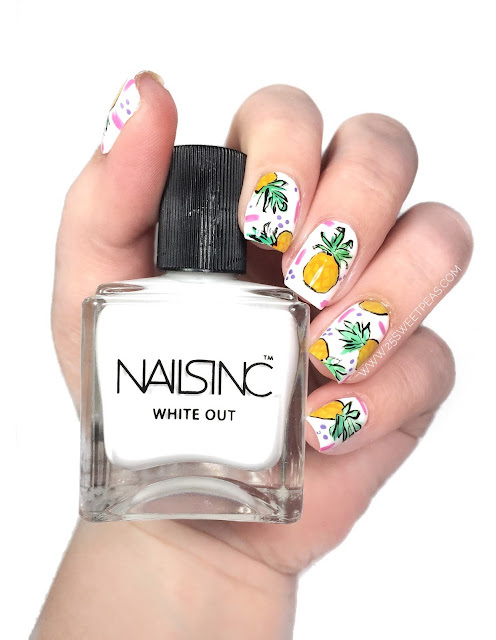 I used Nails Inc White Out which I am loving. Then the rest of the design is done in acrylic paint and freehanded. For this look I started with some watered down yellow acrylic paint, then I did the same things for some green acrylic paint and I actually added a hint of turquoise just to change up the green a bit. 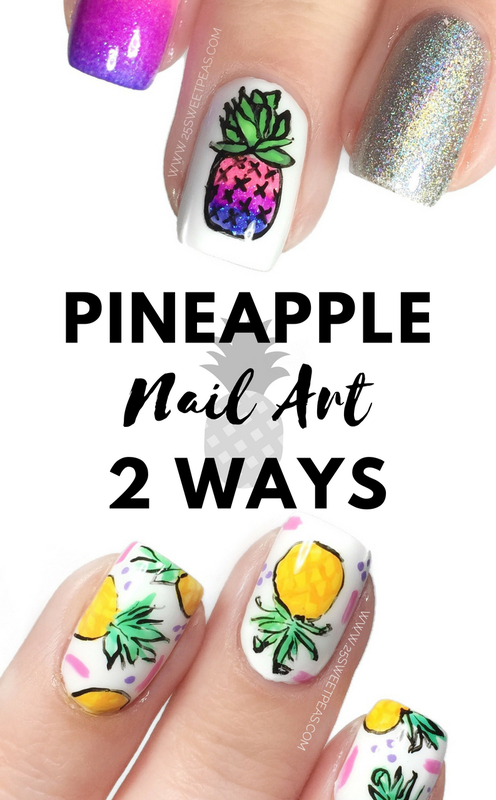 After that I added a bit of orange to the yellow and used that to create diamond shapes on the yellow to add to the full look of the pineapple. Then you outline it all with some black acrylic paint and the pineapple is done. After that I then added in some pink lines and lavender clusters of dots in the empty space. I feel like that just fills in the look and makes it a lil fun. Next up I have a super bright Pineapple look. Not for this one I used quite a few polishes so lets start with the White, its Nails Inc White Out. The holo is Nails Inc Rocket Fuel. Now lets talk about the color in the gradation which also double as the colors in the pineapple. 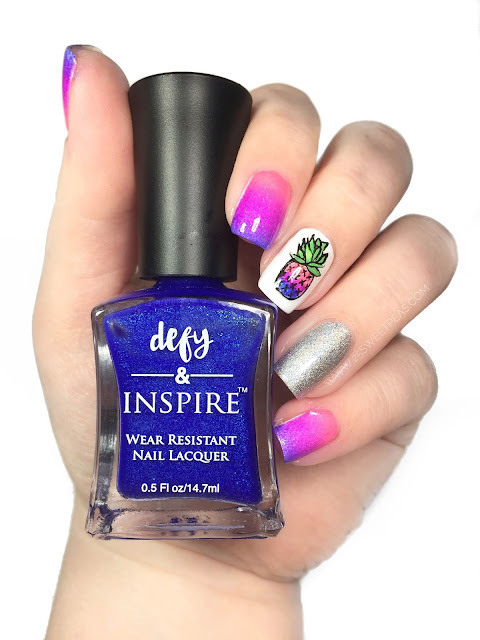 All of them are Defy & Inspire polishes, the coral/pink is called Pop Rock Pink, the Purple is Purple People Eater, and the blue is called Tubular. For the pineapple in this one I started with the black outlines. I made it like a coloring book. Painted on all of the black lines and then filled them in. The green is acrylic paint, and then the others are the polishes of course. If you go over any of the lines tho you can easily fix with black paint again after your "coloring" is all filled in. Ok so typed that sounds complicated, but really its not. Check it out in the video and it will make sense I promise! Well guys that is it! I hope you enjoyed both of these manis! Which one was your favorite? I'm torn, I enjoyed both, a lot. Ah these are SO cute! I will have to give these a try this weekend! Your bright one is my favorite. 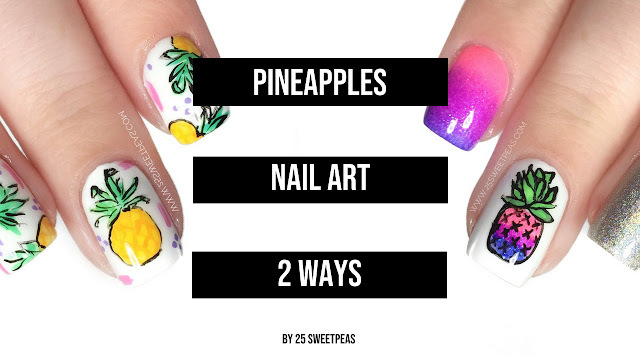 I love how you just have the pineapple on one nail and incorporated all those beautiful brights on your other fingers. Both looks are super fun. That white is so bright! These are so cute and painterly! So fun! 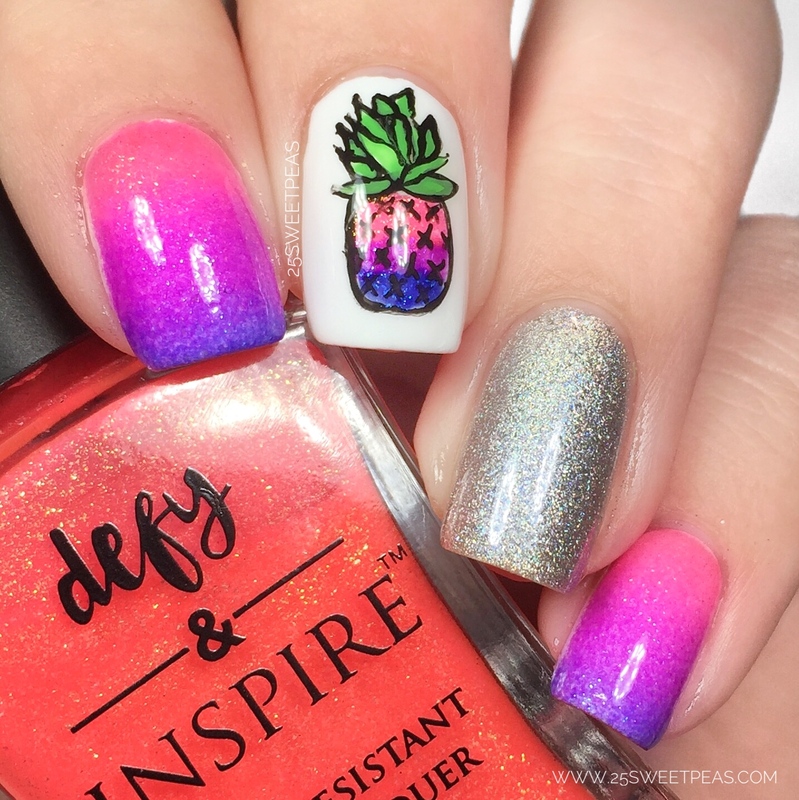 I love the gradient pineapple! ahh these are both adorable! I love the gradient effect! 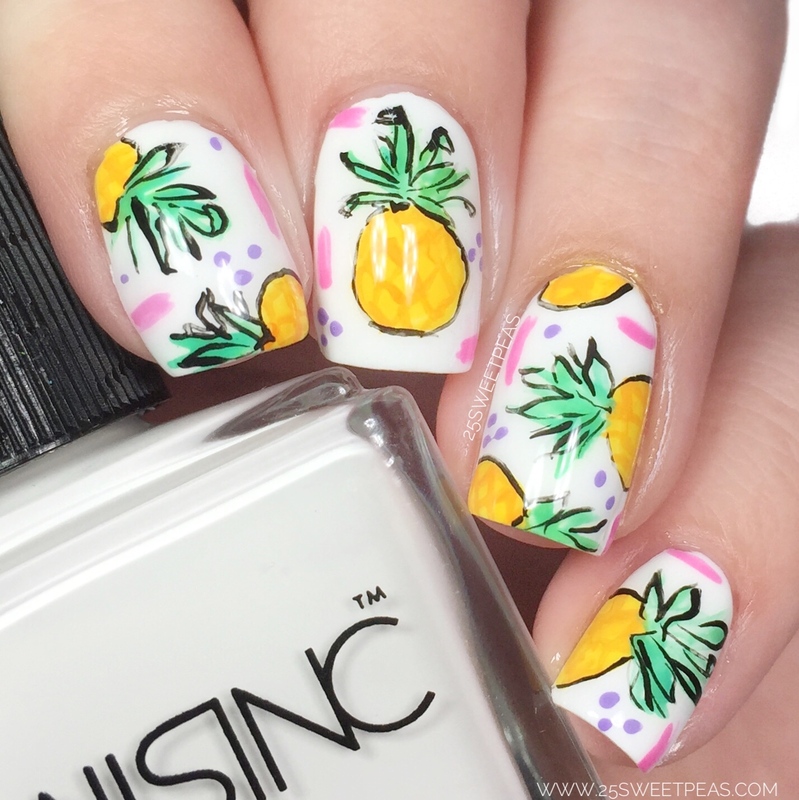 Pineapples are so cute! 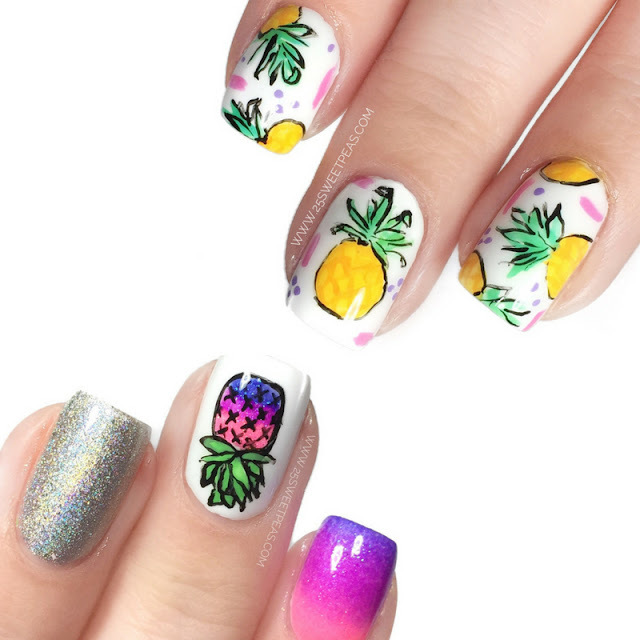 I love fruit nail art designs in general.